Dr. Anjila Aneja is one of the best gynaecologists in New Delhi. She is qualified MBBS, MD- obstetrics & Gynaecology, DNB- obstetrics and Gynecology. With over 20 years of experience as a gynaecologist, currently she is the Director & HOD at Fortis La Femme, Greater Kailash. Send your query to Dr. Anjila Aneja Email Address to fix an immediate appointment. 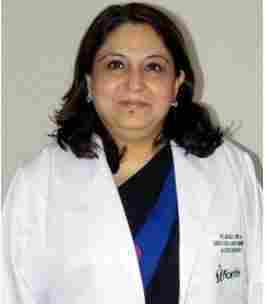 Dr. Anjila Aneja Gynaecology specialist at Fortis Delhi is an MBBS Graduate from Maharishi Dayanand University, Rohtak. She has completed her MD (Obstetrics & Gynaecology) form P.G.I.M.E.R. Chandigarh in the year 1992. She has done her DNB (Obstetrics & Gynaecology) in 1992 and has completed her MRCOG from the Royal College of Obstetricians & Gynaecology in London in the year 1998. She also hold a Diploma in Pelvic Laparoscopy from Keil School of Endoscopic Surgery, Germany and Gisson School of Endoscopic Surgery, Germany in 2006. Send us your query to book your appointment with Dr. Anjila Aneja Director of Obstetrics & Gynaecology at Fortis Gurgaon. The Best Obstetrics and Gynaecologist in Delhi India have many qualifications in National & International journals to her credit. Dr. Aneja also actively participates in Conferences and CMEs. As an academician, she has been a teacher and guide for MRCOG & DNB students. The Best gynaecologist at Fortis Hospital Gurgaon has to her credit to submit thesis, acting as a Co Guide for Student Study on Obstetrics & Gynaecology. She is a life member of AOGD, Gynecological Endoscopic Society, New Delhi, NARCHI, and Federation of Obstetrics and Gynecological Society of India. She is an active member of Royal College of Obstetricians and Gynaecologists. Book your appointment with the most renowned Gynaecologist and Obstetrician in India, Dr. Anjila Aneja on our website. With a rich experience of over 25 years to her credit, Dr. Aneja has been associated with several prestigious organizations such as Apollo Hospitals, New Delhi, Moolchand Hospitals, New Delhi and others. She was also awarded the Fellowship of Royal College of Obstetricians & Gynaecologists (FRCOG), London in the year 2010. Her last assignment was with Max Super Specialty Hospital, Saket, New Delhi as a lead consultant and Head Unit- Obstetrics & Gynaecology. To get quick response, call Dr. Anjila Aneja contact number Fortis Hospital, Gurgaon. The Department of Obstetrics and Gynaecology at Fortis Hospital, Delhi, India offer the full spectrum of women’s health care services such as management of high risk pregnancies/late pregnancies, painless deliveries, among others. Fortis Hospital offers expert gynaecological treatment and specialist services for special disease groups. Our surgeons appropriately address women in different age groups having different health concerns. The hospital provides comprehensive treatment for fibroids which include open myomectomies unsuitable for endoscopic keyhole surgery. To book appointment with consultant gynaecology at Fortis Hospital, Delhi, send your query on Email Address given on our website. Gynaecology & Obstetrics at Apollo Hospital is a speciality that focuses on numerous health conditions that are related to the reproductive system in females. We understand that diseases and illness are uncertain hence we are committed to support and provide you with the best possible treatment for your conditions or illnesses. At Max Institute of Obstetrics and Gynaecology, we offer the best care to women seeking gynaecological solutions. We provide the services such as high risk pregnancy care, preventive health programme, pre-natal classes, reproductive medicine, menopausal care, contraceptive medicine, IVF programme, assisted conception and infertility solution. The unique maternity “Bundle of Joy” programme for pregnant women include the pre-delivery and post-delivery classes, breast feeding classes and infant care. Our state of the art technology includes a Wireless CTG which provides an accurate differentiation between the maternal and foetal heart rate allowing free movement for women during induction and labor. Dr. Anjila Aneja, Director Obstetrics & Gynaecology, Fortis Hospital provides expert views and enriching information on the diet specifically recommended for the mothers to help recover and breastfeed. She was awarded the Fellowship of Royal College of Obstetricians & Gynaecologists (FRCOG), London in the year 2010. Awarded President Silver medal for the best graduate of Rohtak Medical College in 1988. Awarded several Gold and Silver medals in during her MBBS.